You could buy whatever snow blower is on sale at your local big box store, but you may end up getting something that isn’t ideal for your situation. Not all snow blowers are made for you, and Snow Joe gets that every region, every driveway, and every back yard is different. Although you can find a variety of snow throwers from this company, they each have at least one thing in common: They’re all safer for the environment than the traditional gas-powered blower. You won’t even have to sacrifice much in the power department. Take a look at some of the best products Snow Joe has to offer before the nasty white stuff starts falling. 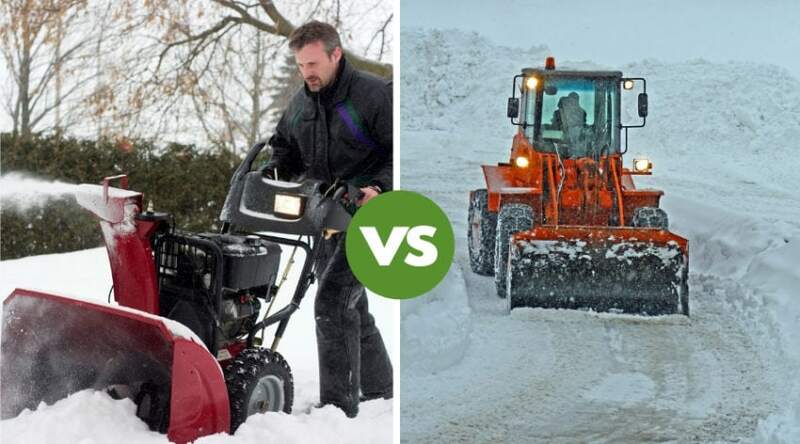 Why are Electric (or Battery-Powered) Snow Blowers Better? It used to be that “outdoor chores” and “eco-friendly” couldn’t be used in the same sentence. That changed, though, when manufacturers like Snow Joe started making tools like snow blowers powered by electricity. Sure, they’re less powerful than their gas-powered counterparts, but the zero emissions they were producing made a good case for swapping the old for the new. The company has been working at making an electric thrower a viable option over the more powerful gas-guzzling cousin, and they’re getting better every day. In fact, they were one of the first manufacturers to cut the cord and offer you an environmentally-conscious snow-blasting tool that doesn’t require an outlet. You can get a cordless, battery-powered blower that manages to clear tall snow drifts for nearly an hour at a time on one charge. Lithium-ion batteries have changed the game for a lot of tools, and now it’s making its way through your snow-covered driveway and walkways. After all, when the division chief of the California Air Resources Board predicts that gas-powered outdoor tools will out-pollute the cars on the road, it might be time to switch the tools in your garage. There are benefits in switching from a gas-guzzler to an electric or cordless blower, though. With either one, you won’t have to buy fuel or find a safe place to store it. There’s also no pull cords or harsh fumes. An electric snow thrower does tie you to a cord, but you can run it as long as you need to finish clearing your driveway. A battery-powered blower gives you freedom to roam without being tripped up or stopped short by cords, but you have a limited amount of time to get rid of the material that has fallen. 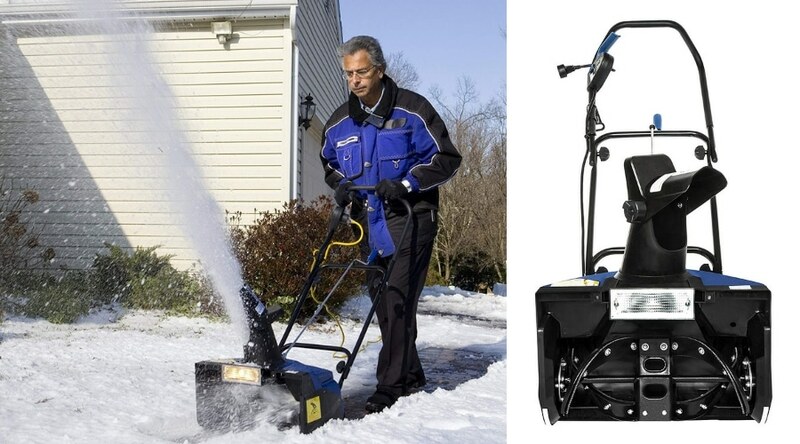 If you’re thinking there’s no way you can give up your gas-powered snow thrower for a Snow Joe because you have too much snow to clear, you may need to revisit the Snow Joe blowers. More than one of this company’s snow blowers that are powered by electricity can clear inches and inches of the stuff in just minutes. A 15-amp thrower may be more powerful than you think. Yes, you will need to invest in a good cold-weather extension cord to power your new snow thrower, and you’re going to have to map out your snow-clearing paths to prevent running over the cord or tripping over it. You’ll also be able to throw out your gas cans. And your neighbors will thank you for not waking them up in the early hours of the morning with a loud blower – electric snow throwers are much quieter. As long as you’re dealing with a moderate amount of fallen material, an electric thrower (or battery-powered one) could absolutely be a good choice for you. 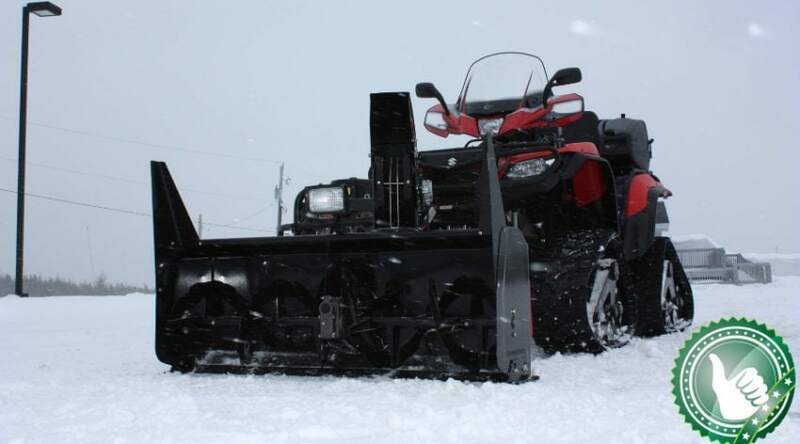 If you have acres of land to clear of the stuff, or you live in the Tundra, or what’s often compared to it, you might not be able to make an electric or battery-powered snow blower from this particular manufacturer work for you. First, you need to assess how much snow you’re realistically dealing with each winter. Smaller blowers from this brand are great for small- to mid-sized driveways that only see a few inches of material with each storm. It’s also a good idea to stay on top of the fall– don’t let it build up and get packed or it’ll make your job much harder. When you need a tool to chew through big drifts of white stuff, up to a foot tall, then you’ll want to choose a more powerful model. 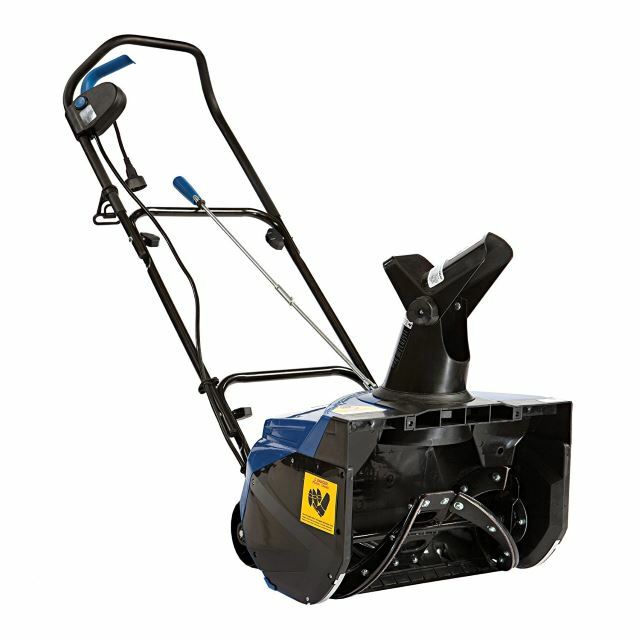 A Snow Joe with a 15-amp motor can move up to 800 pounds of material per minute – which means getting your driveway cleared all the way down to the concrete faster than ever. If you have a driveway full of gravel, then you’re going to want to look elsewhere for a blower that won’t throw stones. These particular throwers do exactly what it sounds like – they pick up material that’s sitting on your driveway and sends it flying either directly in front of it, or to either side of the tool. And these go all the way down to the concrete, so it’ll pick up those pieces of gravel, too, which could make it dangerous. One of the best ways to determine which of these blowers is right for you is to read the reviews. There’s likely a Snow Joe out there that’s right for you and your driveway, deck, and sidewalks, so keep reading! If you need a model in this brand that can handle light to medium snow falls, this affordable thrower may be a great choice for you. 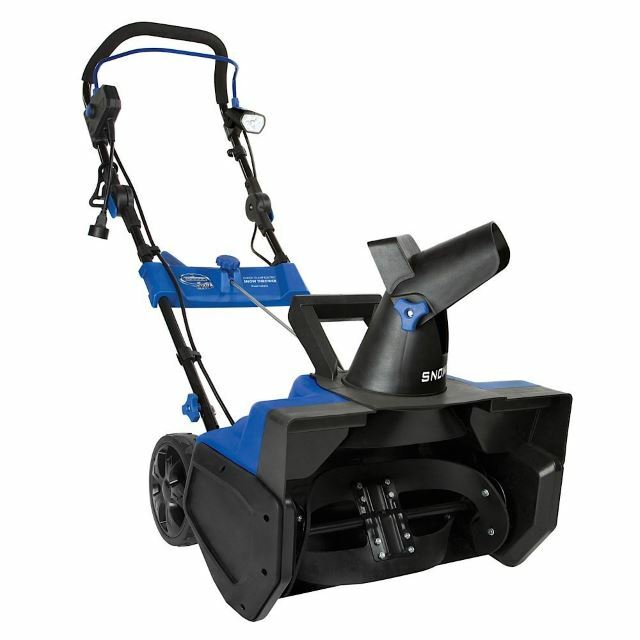 The Snow Joe Ultra 13.5-Amp electric snow thrower is one of the most affordable options on the market, and a great value. 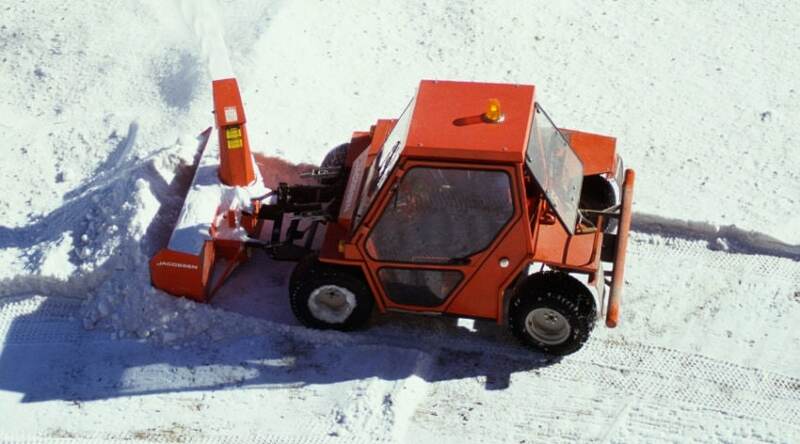 This little snow beast can tackle up to 650 pounds of material per minute, which means you should be able to clear off your driveway in less time than it takes you to get ready for work in the morning. It weighs a little more than 35 pounds and doesn’t require you to pull-start it, or fill it with gas and oil, which means you can easily pull this out from your garage and start using it right away. It comes equipped with steel blades, which chomps through snow more easily than plastic blades, plus they’re more durable. Those blades are also covered with rubber to protect the surface under the snow that you’re plowing. Although this particular blower can move material from your walkways to your yard efficiently, that’s under the best conditions – freshly fallen light, fluffy white stuff. Heavy, wet stuff, or packed material will take longer to move, and it won’t throw nearly as far as the maximum 20 feet that’s listed. Realistically, you can expect it to handle up to 6 inches of the stuff with no problem, and it should be able to toss it where you want it to go by about 8 to 10 feet, under normal (not perfect) conditions. If you need more mobility than an electric model in this brand allows, then this battery-powered snow thrower could be the best choice for you and your property. 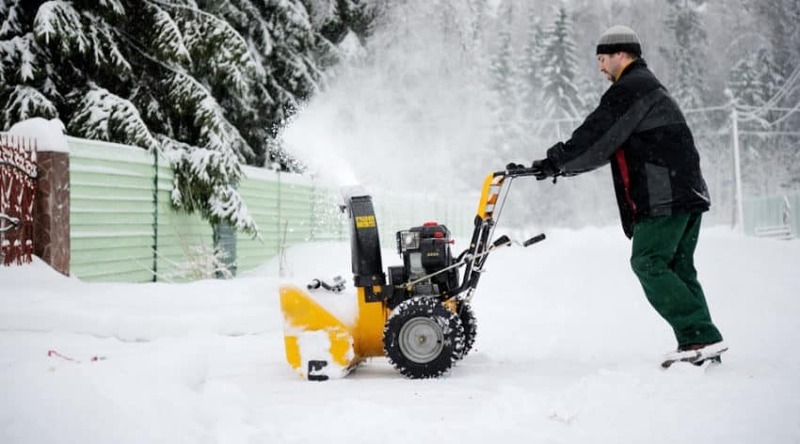 Forget whatever you know about yesterday’s battery-powered tools because this brand has turned the game on its head with the Snow Joe iON snow blower. 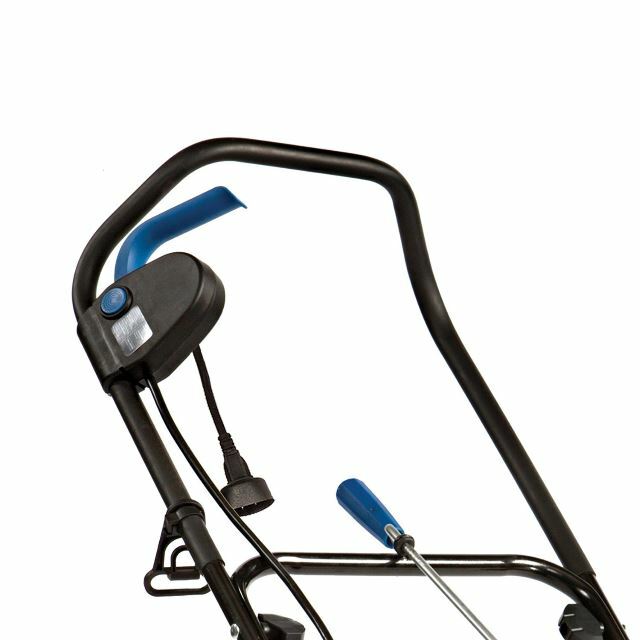 This cordless thrower can clear driveways, sidewalks, and porches without the need of electricity or gas, and it does so with more power than you’d expect, thanks to the powerful rechargeable lithium-ion battery. This particular blower still has some limitations, of course, so you can’t expect it to clear a full ton of material in a couple of minutes, but it can move up to nearly 500 pounds of it per minute. This is best used on fluffy fall that’s light and airy, however, it can still do some damage to wet, heavy stuff. The rubber-tipped steel auger is strong on chopping up the material before it blows it out the adjustable chute, but it’s also gentle on surfaces. The best thing about this blower is that it’s totally cordless, so you can go anywhere with this little muncher. Of course, it is battery-powered, so you have a time limit on your clearing. You can generally get about 50 minutes out of a single charge. Also, this only comes with one battery and a charger, so if you can’t clear everything in under an hour, you might need to invest in a second battery, but those cost about half of the cost of this machine. This is a powerful machine that can easily handle light to medium piles, and it includes a headlight, which makes this a good choice for you if you’re up before the sun clearing your driveway and walkways. 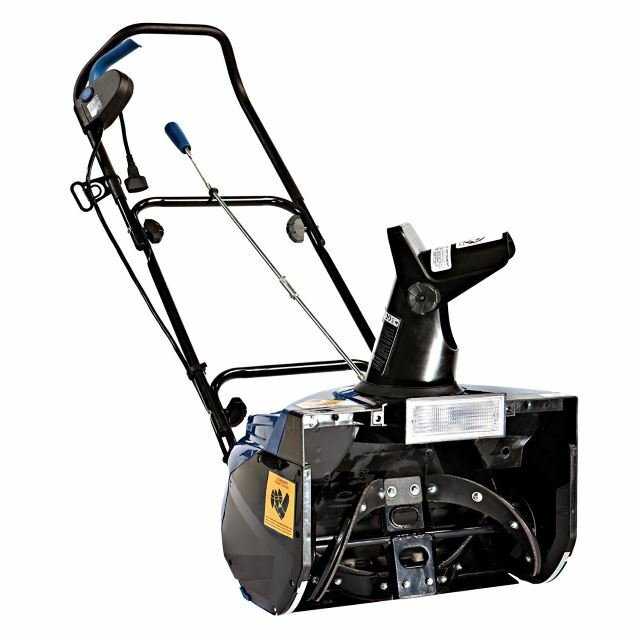 You may look at the specifications of the Snow Joe Ultra snow thrower and think, “I’ve seen this before,” and you’d be right – with one exception. This particular model has the same 13.5-amp motor that’s able to plow through 18-inch wide swaths of material that’s up to 10 inches deep at one time, but it comes equipped with a bright 20-watt halogen headlight. That can make all the difference between clearing your driveway right after a nighttime storm and waiting until morning when it freezes over. Compare this cruncher to a gas-powered machine or other brands, and you’ll see that it’s an affordable option that can move the material effectively from your deck to your backyard. Also, it won’t harm your beautiful wooden deck or driveway because of the rubber-edged steel auger. It’s an electric-powered blower, so you’ll have to buy an extension cord in the right size for the amps. Because of the way it’s powered, though, you’ll notice it’s really not that loud – about the same decibels of a vacuum cleaner, maybe a little louder. It’s easy to maneuver with its pivoting wheels, but you’ll still have to put your back into it with packed material, as this isn’t self-propelled. If you need a powerful electric blower with a light, this particular model could be your best choice to clear tall banks of snow. What kind of snow do you get? Light and fluffy; wet and heavy; or just those snow banks created by the city’s plows? 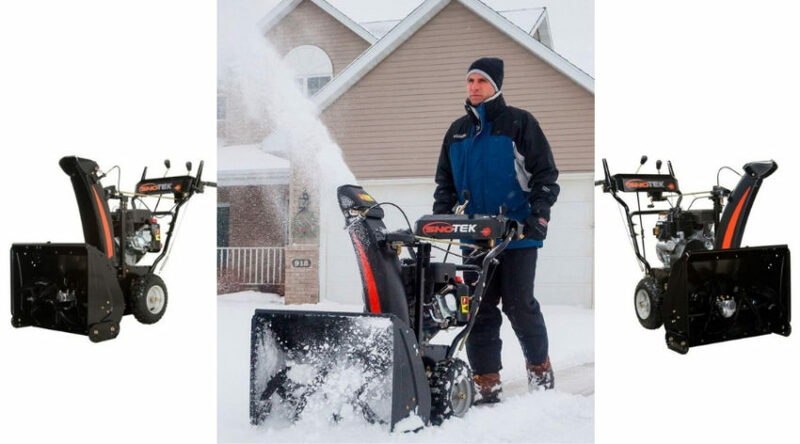 Regardless of the type of white stuff you get each winter, the Snow Joe Ultra 15-amp snow thrower can handle it. The more powerful motor not only helps you get through up to 720 pounds of material per minute, it also shoots it as far as 25 feet in a direction other than your driveway. You have to keep in mind that these electric-powered blowers may be able to handle up to 10 inches in one pass, but that’s under ideal conditions. You’re not always going to get light fall, and sometimes you’re going to have to deal with what the plows left at the end of your driveway. The key is to go slowly with these machines. They can take it, but only a little at a time. It may not be as quickly as you’d like, but it’s definitely faster and easier than a manual shovel. This particular model will require you to put your back into it to cut through the packed banks, but it’ll do it if you’re patient. You may even find yourself having to take a break here and there if your blower clogs up. Thankfully, this blower includes a tool that will let you easily clear out the chute and get back to clearing your paths. Another bonus: This model has a 20-watt halogen light that lets you use it at night or before the sun comes up – and before another snowfall. This lightweight, compact powerhouse of a blower could be your best bet if you need something to clear up to a foot of snow without coming to a full stop. 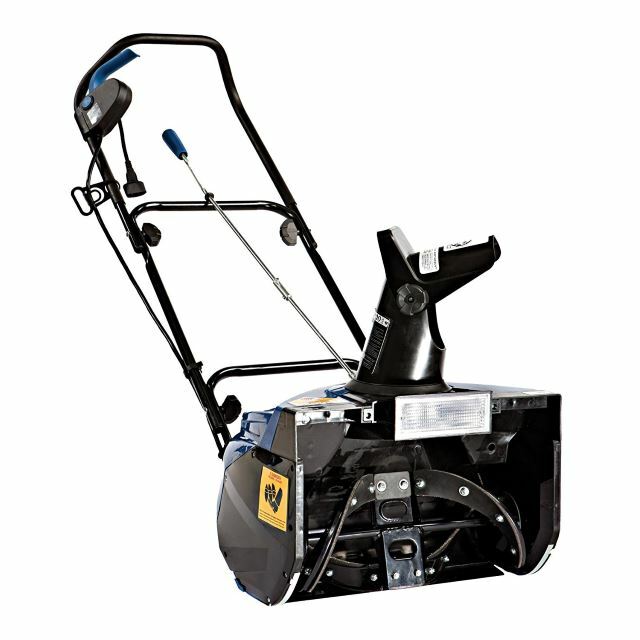 Good luck finding a clean-energy snow blower that can handle the snow the way this Snow Joe Ultra 21-inch 15-amp thrower can. It’s rated to move up to 800 pounds of material per minute – that’s nearly half a ton. Of course, that piece of data is based on certain conditions, and no fall is the same. If you’re lucky, you’ll get a soft, fluffy stuff that’s easy to move from your driveway to your yard, but other times, it’s wet, slushy, packed, or heavy. In those instances, this Snow Joe can manage it, but you’ll have to put a little bit of your muscle behind it and be patient. You could realistically clear a medium-sized deck with a foot of material collected on it in about 15 to 20 minutes. Now just imagine how that translates to your driveway. Perhaps one of the cons that could be added is that you won’t have any more excuses for being late to work. This thrower comes with a chute that rotates 180 degrees, so you can force snow from side to side or directly in front of you. The included LED headlight illuminates your path well enough that you can use this at night and be able to see where you’re going. 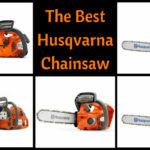 Although this particular model isn’t going to do well with acres of land that need clearing, it can tackle driveways, walkways, and porches by clearing snow all the way down to the surface without damaging anything. Finding the right blower for you is all about figuring out which one fits in your budget, can handle the amount of snow you get, and is best for the type of snow you regularly get. 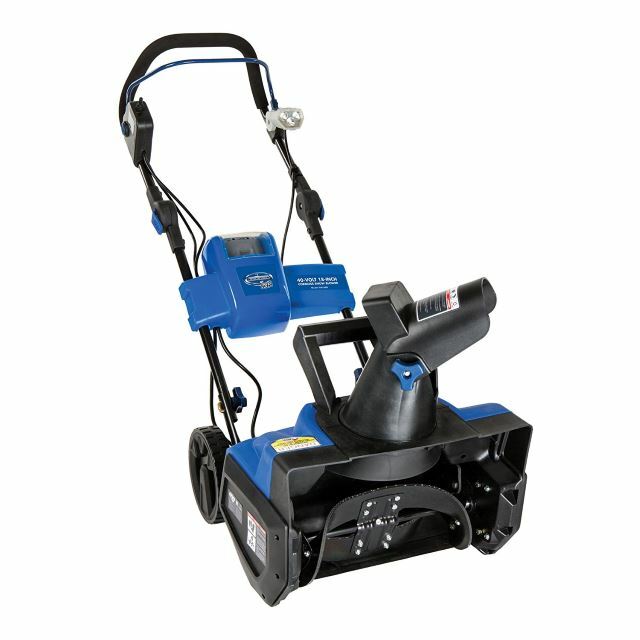 Although there is no one-size-fits-all Snow Joe, there is one that comes close to being the happy medium: Snow Joe Ultra SJ621 18-Inch 13.5-Amp Electric Snow Thrower with Light. 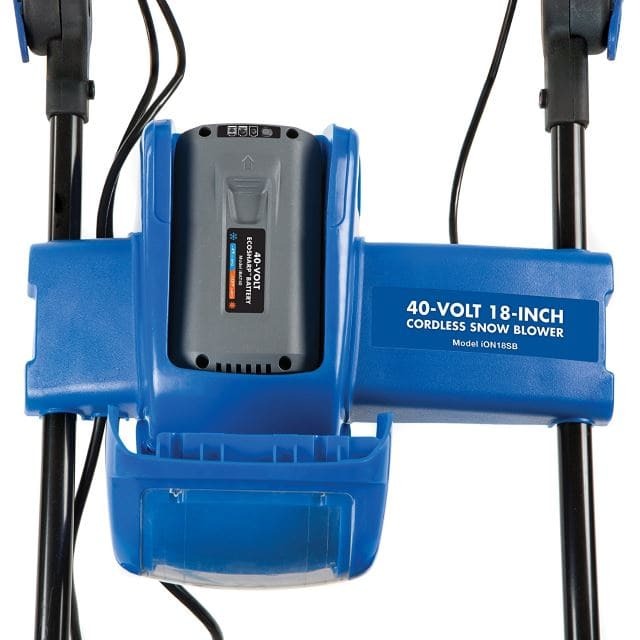 The 13.5-amp motor is powerful enough to handle light to moderate snow falls, and the 18-inch clearance width means you won’t have run more than a few paths to clear your driveway, sidewalks, and deck. It comes with a light, which means you can get rid of snow in the wee hours of the morning, or late at night. It’s easy to use, and it can tackle fluffy or wet snow. This Snow Joe can even manage heavier snows that are tall and packed, but you’ll have to take it slowly and give a thrust or two to keep it going. *You might also like: Troy Bilt Snow Blower Review? Re: the cordless Snow Joe snowblower. If it quits working, you cannot get mechanical parts to fix it. I used mine less than 10 times. It was out of two year warranty. My mechanic knew which part I needed. I contacted Snow Joe. I was told those parts are not available. So my $300+ machine is useless.